Anyone who reads my website regularly knows that I have a big soft spot for Brittany. For three years now, a friend and I have rented a house in the south of Brittany, in the department of the Morbihan. I have written a number of posts on the region, in particular on hiking in the region. I realized recently, however, that I did not know all that much about the history of the region. So I picked up this book in English–apparently one of the only histories of Brittany in English–in hopes of filling in some of my knowledge gaps. 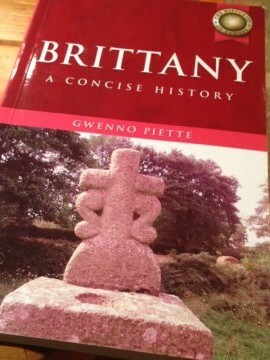 Brittany: A Concise History, by Gwenno Piette, is indeed a concise history. This account that is part of the Histories of Europe series is only 138 pages long, but it is a very dense, detail-packed 138 pages. It starts with prehistoric times (5000 B.C.) and runs to the present time. Only the last 25 pages or so touch on 1900 to the present, and they focus primarily on the two world wars. Is it worth a read? Probably not, if you are not already specifically interested in Brittany. The earlier chapters in particular would be very difficult to follow if you are not already familiar with place names. But if you are a Brittany fan like me and particularly interested in history, this may be the best (or only) history out there in English. Piette’s book helps to explain the historical tensions between Brittany and the rest of France, or at least the Paris-based government. And it shows that despite the peninsula’s distinctive and sometimes insular culture, Brittany historically has been a land influenced by and influencing many outside regions, nations and peoples.